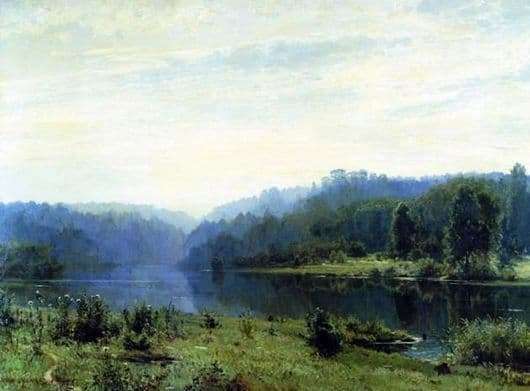 Shishkin has two canvases with the same name “Foggy Morning”. But both canvases are so beautiful that I want to tell about them. On the first canvas we see a deep river, on the banks of which the forest grows. Somewhere in the distance the forest is wrapped up in fog, but here the fog is barely guessed nearby. And whether he has already been here, or whether these beaches are yet to plunge into this white veil. But since this is the morning, then most likely the fog has already left this shore and is just going away. After all, the sun will soon rise, and such a neighborhood is very unpleasant to fog. On the canvas, wildlife and the feeling that everything is swaying and moving does not pass. In the sky, the morning clouds will soon disperse, and a new day will begin, but for now the quivering silence of the morning. On the second canvas, everything is also morning, but only here the river is smaller, and the forest is not so much. But the fog is more noticeable and it is almost close to us, the audience. And the same thing has just been here nearby, and now it is only visible from afar, gently enveloping the forest expanses. The sun has not yet risen, and therefore there is still an opportunity for the fog to indulge on the bank of the river. It is very fog hunt to moisture. On both canvases one feels a special relation to the Motherland, a special love for these endless spaces. No wonder they say that Shishkin was and is a true patriot of his Russia. He, like no one else, was able to betray all the charm, all the beauty, all the elegance of Russian nature. So that he would not depict on his canvases it always turned out superbly simple and interesting in the plot. Foreigners have long said that they have always judged the beauty of Russia by the landscapes of Shishkin. 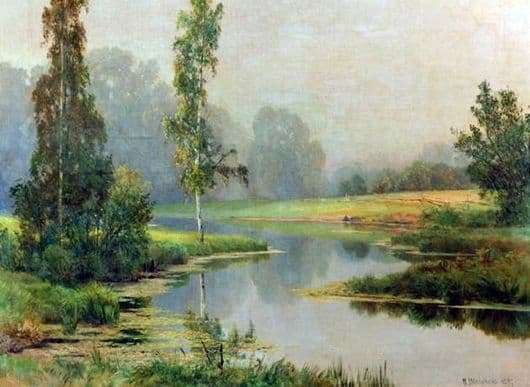 Although there were always enough painters in Russia, but this author clearly stood out among them with the ability to reliably convey the natural beauty of the region, the ability not to embellish, namely, truly portray. Not every artist can avoid the temptation of the popular prints, Shishkin, fortunately, avoided this.